In the early 1900’s several different groups including the Workmen’s Circle, purchased property on the outskirts of Taunton and established a cemetery to serve the growing Jewish community in Taunton and surrounds. 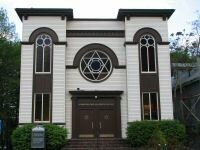 By 1907, the founders of Agudath Achim built a cemetery service building of stone and added stone walls and iron fencing to the front of the property at 19 Glebe Street, Taunton. It was officially name Mt. Nebo Cemetery. In 1990, additional property was obtained for the establishment of Harmony Park, our interfaith cemetery. The following, taken directly from our Bylaws, outlines the cemetery benefit to members. a. Upon completion of five years of membership, a member in good standing may be issued a deed for these lots. The deed shall be issued upon payment in full for perpetual care per grave lot. b. In the instance of membership of less than five years, a member in good standing or member’s estate may purchase a lot by payment of half that of the non-member fee for a cemetery lot. In addition, the deed will be issued only upon the payment of perpetual care fee. c. A member may purchase additional lots at the prevailing schedule rate for members (one half non-member fee per grave lot plus perpetual care fee per grave lot). 2) Non-members may purchase graves at a minimum of twice the member rate schedule, plus the payment of perpetual care fees.